If you know me personally then you know I grew up a vampire lover. A Dracula obsessed reader and film watcher. I grew up with Christopher Lee in his ultimate series of roles as the Prince of Darkness in the Hammer Horror Films. I grew up with Anne Rice’s Chronicles of the Vampires. My first horror movie I ever saw was when I was 5 years old, it was the 1931 Black and White classic Bela Lugosi’s Dracula. 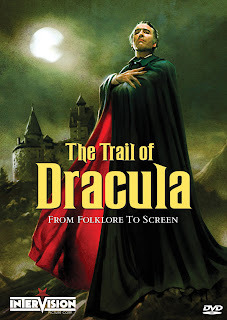 And so when I heard there was going to be a documentary about the one and only Dracula on the legend of the folklore, and also on the movie screen, I was super excited and giddy like a school boy at recess. I found this documentary to be a fantastic watch. It is filled with the legend. The real life Vlad the Impaler. Also explores the one and only Bram Stoker, who basically created the cult phenomenon that is Dracula, and also the continuing pop culture ICON that he has become. It’s amazing because you explore the birth and creation of the legend. From the stage performances, to all the movie adaptions. This documentary is great because it’s filled with experts, scholars, writers and most of all horror historians. Jammed packed with clips, interviews and archival material. From Bela Lugosi who will always be remembered as Dracula, John Caradine as Dracula in 1945’s House of Dracula, and he also played Dracula in the one only Billy the Kid versus Dracula which is a perfect Drive-In cheesy B-movie. He also played Dracula in 1979’s Nocturna. He had other parts in different vampire related films such as 1969’s Blood of Dracula’s Castle, 1969’s The Vampires, 1978’s Doctor Dracula, 1978’s Vampire Hookers. Also in this documentary Christopher Lee who needs no introduction to the Dracula reality. He was, and is my personal favorite Dracula role, besides Gary Oldman in Francis Ford Coppola’s Dracula. Lee will always be in my mind and heart as being truly an icon of cinema, horror history and film period. I think if I had to pick one flaw or negative of the feature, is it’s not long enough. I wanted so much more, they jam pack such a total history into an hour. I would have loved a 2 to 3-hour documentary, but with that said I was still thoroughly entertained. Plus, the extras made up for the time reality. In the end I thought this was a fun, great experience for any horror lover, movie lover, vampire legend, reader and folk lover. You get to see so many classic horror moments throughout cinema history. It's actually a great history lesson on the legend, the truth and the folklore. Directed by both David Mitchell and Jamie Lockhart. They gave fans, as I have said, a great exploration of the legend and the folklore of cinema and literature. This has been brought out by InterVision Picture Corp which a label under Severin Film. A great watch to this legend, icon, nightmarish reality. Perfect for Halloween or any horror movie party. InterVision Picture Corp in my viewpoint always brings out solid products to the fans. From feature films lost by time (or by reason), always entertaining in one way or another. InterVision Picture Corp brought out a great documentary, The Trail of Dracula is for the fan, by fans. Should be displayed on any film or literature lovers shelf. You get a wonderful array of movie trailers about Dracula or vampires. 94 minutes of movie trailers, pure priceless. It was worth the price of payment just for it. It’s a great exploration of this legend. This 94-minute montage of trailers would be great for Halloween parties or spook parties, having it playing in the back ground. This set of trailers is amazing because you adventure into the realm of weird, and popular examples of Dracula. The trailers span from 1931 to 1976, equals priceless. A wonderful cool interview with one of the greatest film directors ever, the one and only Werner Herzog on Nosferatu. Another amazing interview with the one and only actor Udo Kier. The interview is called Blood For Udo. I am a huge fan of Udo. Udo is an amazing performer. I have always felt he never got the limelight he so deserves. This was a perfect listen. A great watch. Next you get an amazing Audio interview by yes, Dracula himself. The one and only, God Rest his soul, I still can’t believe he is gone, Christopher Lee. Another Audio Interview this time with Francis Lederer. Lederer was a truly gifted and amazing actor. He starred in so many important films. He started acting in 1928 and acted up until 1971. He starred in the masterpiece 1928’s Pandora’s Box. The great 1939’s Confessions of a Nazi Spy. And the one and only which is the key importance of the audio Interview for this release, 1958’s The Return of Dracula playing the main character Count Dracula. If you’re a true fan of the Dracula legend, and the legend inside the cinema history of the character then this to me is must see experience. A wonderful documentary, a little over an hour. It's jam packed with a solid array of information on the subject through legend, book and film. Make sure you head over to https://severin-films.com/ to buy all the wonderful DVD releases from InterVision and Blu-rays from Severin FIlms. The main page that gives you these beautiful releases on top quality DVD's and Blu-ray Special Editions.